Safe Work Sites. Increased Security. OSHA Compliance. Roofing is not only a high-risk job, but virtually impossible for you to monitor due to contractors at high elevation. That’s why we designed high-altitude mobile security solutions that can be quickly deployed at any work site. 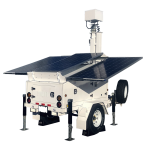 Optiview has teamed up with ArmorLogix to offer multiple solar powered platforms that are easily transportable from site to site, and can be customized to fit your needs. We offer a smaller cart that can be pushed by a single person, that has a mast that can be raised up to 18 feet, as well as a larger street-legal DOT approved trailer with a mast that can be raised up to 30 feet into the air. Both models come equipped with solar panels and safety features to ensure safe use. The larger trailer also has a generator option available for guaranteed 24/7 coverage. Our solar platform is IP based and can host any number of network security cameras, wireless bridges, 3G/4G cellular network devices, and GPS tracking devices. While at a Trade Show recently, the Operations Manager at Optiview was able to log into the camera using his smart phone and review the progress of the the roof repair and replacement with the roofing contractor. 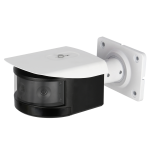 The most popular surveillance cameras to add for roofing companies is a 180° panoramic camera and a HD IP PTZ. 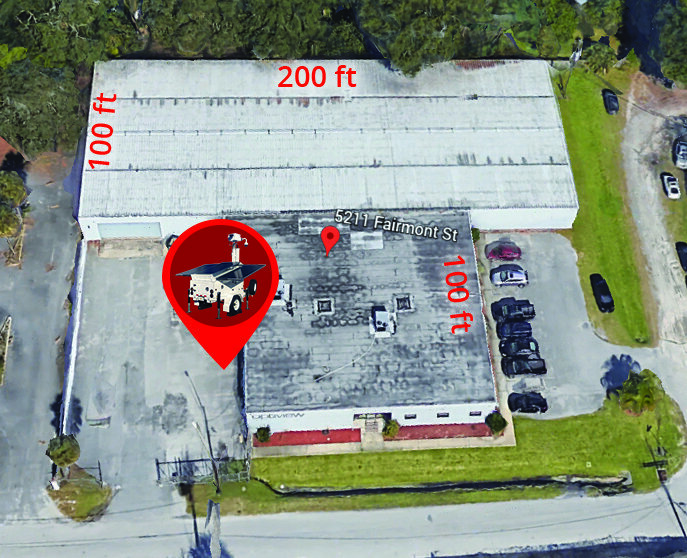 When paired with a 180 degree panoramic network camera, Roofing contractors can keep an eye on large areas to ensure their workers are performing as expected and to review job site safety. 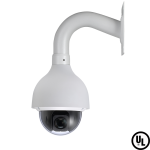 Contractors also use the Optiview VMS to control high definition network PTZ cameras to view their workers and the job site in more detail, show business owners real-time job site updates, as well as work through unexpected complications. We understand that everyone has a budget, which is why we have financing and leasing options on all of our mobile solutions. 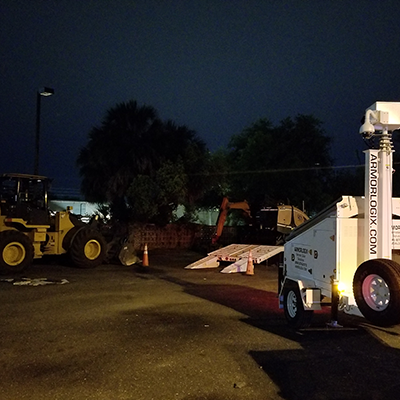 Our technicians are standing by to help you find the perfect fit for your company’s needs, so call us today at (904) 805-1581! Add mobile surveillance platforms to raw construction sites to watch over construction materials, equipment and tools often left on site. Optiview provides solutions for remote sites, and locations where there is no infrastructure in place for power or data.